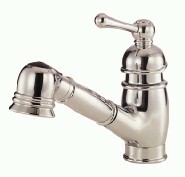 FaucetCentral.com is new and will attempt to educate the Internet community about faucets. Most people understand and recognize the differences between cars, but haven't a clue about faucets. If you think of faucets the same way that you think of cars, then you can immediately grasp many of the same concepts of faucet differences. That is, faucets and cars come in all qualities and performance and durability and are definitely not all alike. Cars generally get you to your location and faucets generally will allow you to get water. Most people understand that a BMW is FAR superior to a Yugo. Most people will pay more for leather seats and they also recognize why leather costs more. Can you imagine anyone paying Mercedes prices for a Chevy? It certainly does happen with faucets that some people look at all brands as being equal. Most people just don't know the difference between brands of faucets and that is our goal at FaucetCentral. To educate the differences of faucets. Soon we will do that. In the meantime, we would like to recommend Danze faucets, Delta Diamond Seal faucets, Fisher commercial faucets, Hydrotek electronic hands free faucets, Sloan commercial faucets, Speakman faucets, Symmons faucets , and T & S commercial faucets. There are plenty of other brands. Some great, some good, and some not so good. All mechanical and man made equipment, cars, and ALL faucets, eventually stop working and need parts. If you can't afford a BMW or Mercedes that isn't a problem; as Toyotas, and Hondas are great value modes of transportation. In the world of faucets there are plenty of Yugo type faucets and BMW type faucets. Durability and long lasting faucets? Do you want to be "stuck" with a car or a faucet where parts are virtually impossible to get? All faucets will eventually leak. Ideally faucets "should" be reliable and the length of time between "servicing" (repairing) your faucet should be very infrequently. If you stick with a quality oriented faucet manufacturer, as well as a reputable supplier, you won't regret making that new faucet purchase.